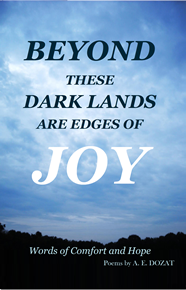 Beyond These Dark Lands Are Edges Of Joy: What Is My Purpose For This Collection Of Poetry? What Is My Purpose For This Collection Of Poetry? I have written poetry since elementary school. I love the art form, and the way poetry can say something in a meaningful way. For some people poetry is cathartic, a method of therapy, self-discovery, a way to vent, for others it is a powerful tool for communication. For me, it is some of that but something more. When I started this project I was already working on another one but felt that God was calling me to turn from it and build this collection, instead. I was sitting in church and listening to the pastor preach and I don't remember what he was preaching about but somehow I began to think about all the hurting people in this world. I believe that my writing is a way to help others. Maybe my poems will help them take a step forward or maybe my poems will inspire them to keep on going and not give up. Maybe my poems might give hope to someone who feels they are at the end of their rope. This book of poems might reach someone who would never go inside a church or see a counselor. A concerned friend might share it with someone who is going through a loss or hurt. A pastor might leave it after praying with someone over a tragedy and they can read it when they are ready. It might be in the lobby of a house of worship and a person with a secret pain might pick it up when no one is looking and later in quietness find comfort and hope. I always wrote poetry and always dreamed of publishing a book. I believe God puts dreams in our hearts to help guide us. Of course, the primary way He reveals His will is through His Word the Bible. From the Scriptures, I know His will is for us to share the Gospel and be His witness. So balancing the scriptures and my dream to publish my poetry I wrote this book of poems for those who are hurting and struggling with the deepest hurts and losses in life. In this book are words to comfort and hope to people. It is not another book of cheap overused platitudes, nice sayings or vague nonsense but offers hope that is thoughtful and substantial. I wanted the meanings to be easily found but leave you with much to think about while pointing to the God of all Comfort and His Christ. This book concludes with an appendix which is a three-page explanation of the Gospel of God's love and His Son's sacrifice to pay for our sins. I hope that the poems and scriptures will be used by God's Spirit to prepare a person's heart so that when they read through to the end and they will learn how they can have hope in Christ.